Today was the first day of Orlando Hamcation. We arrived a little before the gates opened, and wandered around looking at all the things until around 5 or so. With three buildings full of exhibitors and vendors along with the “bone yard” (aka tailgating), there’s a lot to see here. We started off in the Commercial I/II building where all the…well, commercial vendors were. All the big name companies in radio were there: Kenwood, Yaesu, MFJ, etc had tables, along with a bunch of other smaller but well known companies. Plenty of radios and accessories to look at. The “Swaps” building was definitely the most interesting place. Basically one very large garage sale with just about everything radio related you could think of, and a lot of other non-radio things thrown in for good measure. Had an eyeball QSO with Russ/N4RTD/@747Russ. One of the highlights of today was visiting the ARRL table to see if anyone could tell Connie about the Wouff Hong. 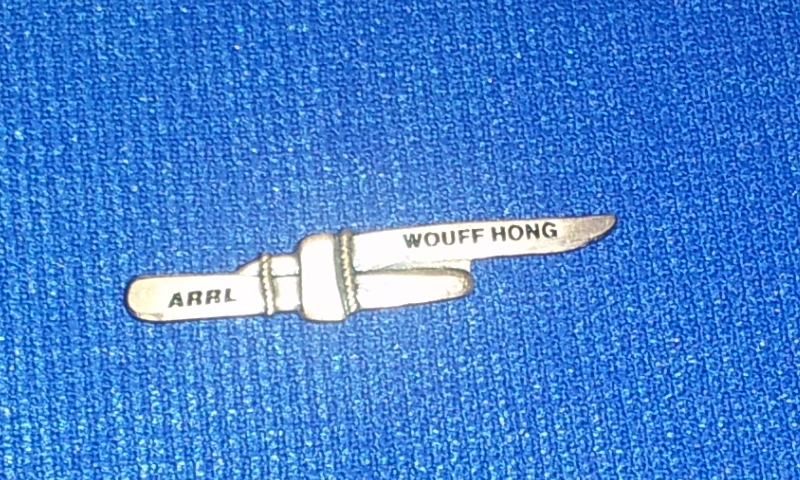 Robert (NQ1R) did one better and showed us the Wouff Hong (well, a Wouff Hong pin really). To top it off, Robert took a picture of Connie and me and posted it to the ARRL Facebook page. Connie won all the scavener hunt points for those two feats. 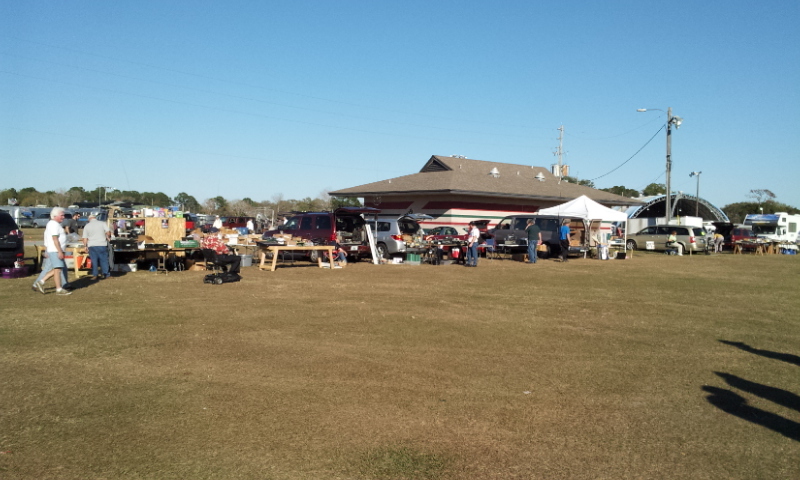 We met up with Connie’s dad again and spent some time wandering around the tailgating area to see what people out there had to sell. Got some good antenna building tips from him while we were looking. I saw a few things that I was tempted to lay down some cash for, and a lot of antenna components that I was interested in. Lots of old vintage radio gear that was pretty cool. Saw some pretty decent looking straight keys that I was tempted by. Vibroplex had some very nice keys at their table, but a bit out of my price range. 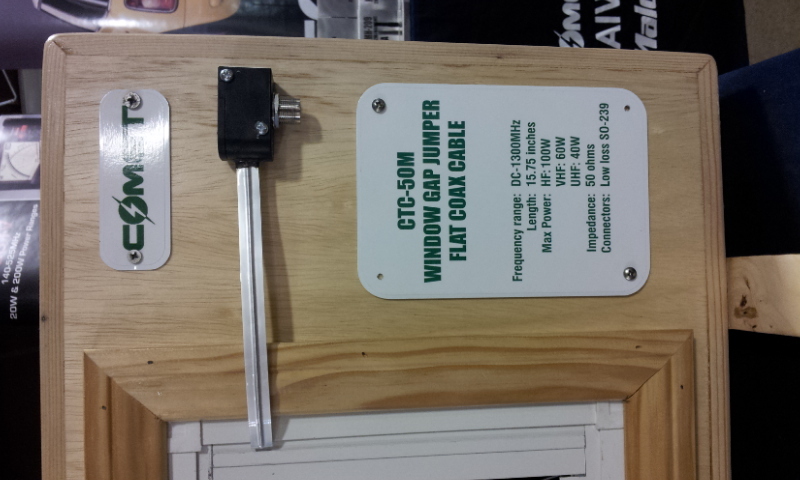 I thought this window gap jumper from Comet was pretty brilliant. Flat coax for running the antenna line into the house through a window. Didn’t see any antenna analyzers around though. Tomorrow we’ll head back and I’ll have a closer look at everything again and probably pick up a few things. Also looking forward to meeting up with a few people tomorrow.